On Friday night we cooked a very healthy risotto from Survival of the Fittest, an Australian Institute of Sport (AIS) cookbook featuring a collection of athletes’ favourite recipes. While some of us enjoyed it (Craig), others (Jess) thought that it was a little bland and some white wine or lemon juice would have added extra flavour. Reduce the heat and add about 500ml of the stock and stir. Once the rice is cooked stir in the cheese then add the chicken. Serve on a plate and garnish with the spring onion. 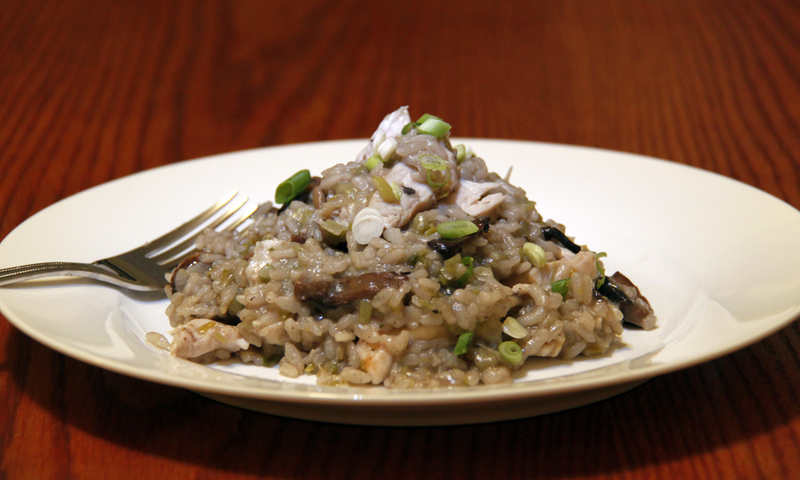 This entry was posted in Dinner, Food and tagged Athlete, Chicken, Dinner, Food, Mushrooms, Rice. Bookmark the permalink.